We all know traditional meatballs in marinara sauce are a family favorite, but you might try something different on the next spaghetti night. Apple cider and maple syrup add the perfect touch of sweetness to this flavor-packed, savory dish, without being too sweet or overwhelming. Every time we make these little gems, the aroma wafting from the kitchen is so amazing! 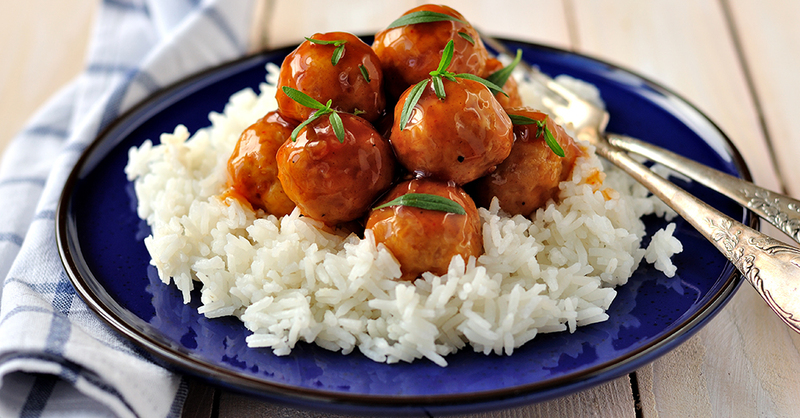 And there’s no need for sauce with these meatballs – they’re already swimming in a sticky glaze you’ll want to eat by the spoonful! Serve them up on a bed of rice or noodles, it’s up to you, but one thing’s for sure – once you make these delicious morsels, kids and adults alike will be requesting this meal often! 1/3 cup apple, shredded and drained of juice. Combine ground turkey, garlic, apple, onion, bread crumbs, salt, and pepper in a large bowl. Once thoroughly mixed, hand-form into 1-inch balls. Line a cookie sheet with aluminum foil. Place meatballs on foil, evenly spaced, and bake in oven for 20 minutes. While the meatballs cook, make the glaze by combining apple cider, soy sauce, ginger, apple butter, maple syrup, chili garlic sauce, and corn starch in a medium bowl; whisk thoroughly. Pour glaze into medium saucepan, and bring to a slow boil over medium heat. Reduce heat, and simmer until the glaze thickens, about 5 minutes. Add the finished meatballs to the saucepan. Cook for one minute so the glaze coats the meatballs completely. Garnish with green onions, serve warm, and enjoy!